Reports that two young children developed leukemia after being treated for immunodeficiency with their own retrovirally modified bone-marrow cells delivered a severe blow to confidence in gene therapy as a treatment. Two reports, published since the trial was initiated, now take away some of the mystery as to why these events happened and allay fears for the safety of gene therapy across all therapeutic applications. Mark Antony, in Julius Caesar by William Shakespeare. Recent findings have shown that that two young children treated by gene therapy to reverse their profound immune deficiency developed leukemia as a direct result of the experimental protocol [1, 2]. These reports follow the tragic death of a young man after treatment with an adenoviral vector  and a more generalized sense of disappointment that the seemingly over-ambitious aspirations of gene therapists have not lived up to expectations. Against this backdrop, it is easy to feel a certain comradeship with Mark Antony, as he prepared to deliver his oration for the assassinated Emperor Julius Caesar in Rome. Brutus had just finished justifying to the assembled masses the apparently compelling reasons for the recent assassination based upon fears that Caesar's ambition had turned from nobility into dangerous liability. So it is now with gene therapy, where whispering voices suggest that the ambitions of this field have outstretched its capabilities. Even the likes of Mark Antony might struggle to marry compassionate appreciation of previous problems, which will no doubt recur, with the eloquence to convince an audience that this remains a discipline where remarkable advances have been achieved. The leukemias induced in two of ten children treated with gene therapy for an immuno-deficiency syndrome came as a double dagger blow to the heart of the gene-therapy field. These children were born with X-linked severe combined immunodeficiency (SCID-X1), which is caused by the genetic loss of the gene encoding common γ chain of the interleukin-2 receptor (IL-2Rγc) in mature γδT cells. Bone-marrow stem cells from the ten children were removed and infected with a retroviral vector encoding IL-2Rγc ; the treated stem cells were then re-infused into the children with the hope that the stably expressed, and integrated, IL-2Rγc gene would restore immune function to T cells as they re-populated the patients, thereby conferring systemic immune competency. This would permit the children, if all went well, to lead a life free of intensive quarantine . But three years after the therapy was administered two of the children developed T-cell leukemia [1, 2]. Not only did the leukemias originate from the re-infused T cells, but it has become clear that the integration of the retroviral vector was itself a major driver in the evolution of the leukemic phenotype . In particular, the leukemic cells from both patients had integrations of the vector very close to a cellular gene called LMO2 , deregulation of which has been observed in human T-cell leukemias . As distressing as these reports have been, there is a second reason for profound disappointment at the outcome of the SCID-X1 trials. The findings of treatment-induced disease have inevitably deflected what was beginning to build into huge elation at the fact that, in 9 out of 10 of the treated children, the therapy had really worked . This trial did, and still does, represent a truly remarkable triumph as the first unequivocal success for gene therapy. Many of the treated children have been able to resume normal lives outside of isolation and their prospects continue to be good. The finding that gene therapy had converted a severe immune-deficiency syndrome into a leukemia is therefore a particularly unwelcome diversion from what would otherwise be banner headlines stating that gene therapy is finally delivering on its medical promise. Is it yet possible to change the perception that success can only go hand in hand with harm, as in the SCID trial, for any gene-therapy endeavor in the future? What would it take to reverse the tide of opinion mounting against the over-reaching ambition of gene therapy? One way to change opinions would be to obtain evidence for a uniqueness and specificity associated with these adverse clinical events, so as to suggest that they do not represent the inevitable face of things to come for any protocol involving gene transfer. Such evidence (to sway lingering Brutus-like assassins) has now come in the form of molecular characterization of the etiology of the leukemias in the two affected children [5, 7] and an insightful study showing why they were not predicted earlier . One of the big mysteries has been why the adverse events had not been predicted by the numerous pre-clinical studies for the relevant gene therapy trial. A large part of the answer came in a study reported in 2002 , which was, unfortunately, well after initiation of the trial . The 2002 short report from Li et al. described the development of a similar leukemia in mice following gene transfer of a retroviral vector into bone-marrow-derived stem cells (Figure 1). There were two key aspects of novelty in this report, which explain why the phenomenon had not been seen before in the pre-clinical studies supporting the safety of the strategy used in the children with SCID. The authors used a retroviral vector to infect bone-marrow cells and re-infused them back into immunodeficient mice - with obvious parallels to the human clinical trials that had started a year or so earlier. In these re-infused mice, no leukemia was observed (Figure 1a). But because the lifetime of a single mouse may not be long enough to observe the evolution of fully transforming events - which are known to require co-operation between changes in multiple genes - the authors also serially transplanted the adoptively transferred bone marrow into a further irradiated (immune-deficient) recipient. Within 22 weeks of the passage from mouse to mouse, all the animals that received the secondary transplant developed hematopoietic disorders, and 60% developed an acute myeloid leukemia (Figure 1b). Unmasking retroviral vector-mediated leukemogenesis following bone-marrow transplantation in the mouse. (a) Li et al. used a replication-defective retroviral vector, similar to that used in the patient trials , but this time encoding a commonly used marker gene dLNGFR. Because the bone-marrow cells were infected ex vivo, the re-infused population almost certainly contained a clone in which the dLNGFR retroviral vector had established a pre-transforming environment (thus providing transformation signals 1 and 2 by mechanisms described below). Transplanting this clone into an irradiated mouse meant that the pre-malignant clone had plenty of immunological space to differentiate into a T cell and then to undergo multiple cell divisions in order to re-populate the depleted T-cell compartment. In some progeny cells further genetic mutations would occur to mature the transforming process (signals 3 and 4). But within the life time of the recipient mouse, there was still insufficient expansion of the pre-malignant clone to produce a daughter cell with all of the required signals for full leukemic transformation. That mouse was therefore phenotypically normal with no apparent disease. This is where many of the pre-clinical studies on bone-marrow cell transplantation with vector-modified cells were terminated with an apparently safe outcome. (b) Li et al. took the experiment one critical step further. Transplanting the bone marrow of the first mouse into a second irradiated recipient allowed for further homeostatic expansion of the pre-malignant cells, which was sufficient for the final necessary transforming mutations (signal 5, or more) to accumulate in the genome and to produce complete transformation of a single cell. Uncontrolled proliferation of this cell leads to leukemia. (c) Molecular analysis of the leukemias that developed in six of ten mice in the study by Li et al. revealed the molecular pathways by which the dLNGFR gene could contribute to at least the early, pre-leukemic mutations. In these gene-replacement trials, the dLNGFR gene was meant to encode an inert molecule to tag infected cells. But it in fact encodes a receptor for a growth factor (a neurotrophin) and in the construct used by Li et al. it was modified to remove its cytoplasmic domain. This deleted domain is usually proapoptotic. In hematopoietic cells, the deleted version of the receptor can contribute to signaling of growth signals (signal 1) but now presumably without the pro-apoptotic domain to keep its signaling activities in check. These growth signals alone are insufficient to transform T cells, but in the presence of additional growth-deregulating mutations within a cell the accumulated signals (1-5, for the sake of example here) can lead to complete malignant transformation of a T cell. The authors also demonstrated that, in all cases, the vector had integrated into the same cellular locus, the Evi1 gene. Evi1 is a transcription factor whose deregulation by the viral sequences in a precursor T cell probably provides a second predisposing transforming signal (signal 2 in this case). Co-operation between the dLNGFR and Evi1 signals would then set the stage for the evolution of further transforming signals (3, 4, 5, and so on) in the progeny cells as they undergo the enforced homeostatic proliferation described in (b) and (c). These experiments included two critical factors that had not been tested together prior to initiation of the clinical trials. The first was that the life time of the transduced, reconstituted cells was extended beyond a single mouse's lifetime, allowing observation of slow-developing, accumulating and co-operating mutations; and the second factor was that the modified marrow cells were re-infused into an immunologically depleted cell compartment. Homeostatic expansion of the cells was, therefore, both possible and inevitable , allowing for greater proliferation of the transduced cell population and the subsequent accumulation of additional genetic 'hits' leading to transformation (Figure 1c). The authors showed that the transgene that had been present in the retroviral vector - the dLNGFR gene - was critical to the development of disease. The dLNGFR gene is commonly used as a marker gene for such studies but - and with significant similarities to the IL-2Rγc gene used in the human SCID trials - it is also a growth-factor receptor that could signal potentially transforming growth signals to transduced cells. Other marker genes used in the same protocol did not induce leukemic expansion of infused cells. Also, in a parallel to the findings from the SCID trial that were soon to emerge , all of the mouse leukemias contained a vector integrated into a single genetic locus: the murine Evi1 gene (Figure 1c) . Thus, Li et al. report a retroviral vector-induced leukemia that is dependent upon first, the transgene carried by the vector; second, the site of integration into the genome of transduced marrow progenitor cells; and third, a state of immune deficiency in the recipient hosts resulting in forced expansion of the transduced T-cell population (Figure 1). Insertional mutagenesis, in which a promoter or enhancer in the vector transactivates the expression of an adjoining proto-oncogene, or in which the vector itself inactivates a tumor-suppressor gene, has long been viewed suspiciously as an unwelcome result of the use of any integrating vector . The frequency of insertional mutagenesis is, however, predicted to be very low and so it has not been seen as a barrier to the use of such replication-defective vectors in clinical trials [10–12]. Nonetheless, even the most committed retrovirologist cannot fail to be concerned at a frequency of two insertional mutagenesis-induced leukemias in a group of ten subjects . Therefore, while in no way belittling the significance of a second patient developing a leukemia, the finding that the etiology of the disease in the second patient was also associated with the same LMO2 gene paradoxically gave some reassurance . Given the large range of known T-cell proto-oncogenes, the fact that both cases turned out to have integration sites around the same cellular gene argues strongly that the events were disease-, protocol-, and probably cell-type-specific, as theoretically and mechanistically argued by McCormack and Rabbitts . This suggestion implies that such adverse events are not necessarily to be expected following the use of retroviral vectors in all contexts, an important get-out clause for the survival of retroviruses as viable vectors. The strength of this argument was confirmed recently by a study driven by the gift of hindsight, in which a search of a mouse retrovirus-tagged genomic database, containing insertion-site data from in excess of 3,000 retroviral-induced hematopoietic tumors, revealed records of two leukemias associated with insertion at the Lmo2 gene . One leukemia had a retroviral insertion both in the Lmo2 gene and in the IL-2Rγc gene - precisely the gene combination involved in the SCID trial leukemia cases (Figure 2a). The chances that the leukemic murine cells would have retroviral insertions at both genes without them being involved in the leukemogenesis are minimal. The authors therefore suggest that these data show highly persuasive evidence that the IL-2Rγc and Lmo2 genes can co-operate in the formation of leukemias (Figure 2a) , a proposal that now has considerable mechanistic support . It is only a very short step to connect the introduction of the IL-2Rγc gene within a retroviral vector that also happens to integrate close to the Lmo2 gene in the patient's cells with the initiation of cooperative transformation of the progeny cells of the treated children. Add to this that the children were themselves immune-depleted, and therefore would allow enforced expansion of the transduced marrow cells, and the similarities between what was observed in the mouse [7, 8] and human  studies becomes clear (Figure 2b). The retrospective study by Davé et al. sheds light on the molecular mechanisms behind the formation of leukemias in children in the SCID-X1 trial [1,2]. (a) The precedent for T-cell transformation by co-operation between the Lmo2 and IL-2Rγc proto-oncogenes. The retrospective database search by Davé et al. revealed that a murine leukemia, 98-031, had been previously reported in which two separate retroviral insertions had occurred close to the Lmo2 and IL-2Rγc genes. Insertional mutagenesis effects (gray arrows) from the transcriptional elements of these proviruses probably led to the deregulation of expression of both cellular genes, providing growth-deregulating signals (signals 1 and 2) within the cell. These signals alone were probably insufficient for leukemogenesis, but they may have set up a transforming loop that allowed the infected cell to proliferate more freely than normal . This in turn allowed the accumulation of an unknown number of further genetic mutations that, additively, would provide sufficient additional growth-promoting signals to the infected cell to lead to its complete malignant transformation (signals 3-5, for example). (b) An exactly analogous molecular co-operation is likely to have been responsible for the evolution of the leukemias in the two children in the SCID trial. In this case, the intentional introduction of a retroviral vector encoding the IL-2Rγc gene into the bone-marrow cells of each patient led to integration into (in one patient, shown here), or close to (in a second patient, not shown), the LMO2 locus. 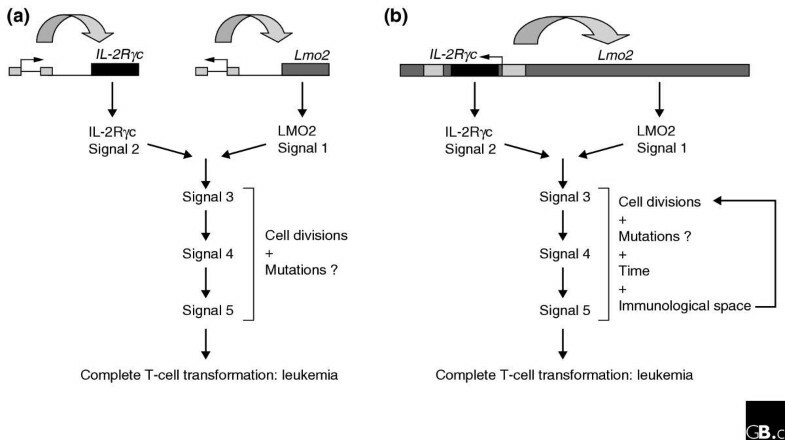 As in the precursors to the murine leukemic cells, additional mutations were presumably required in order to accumulate sufficient signals for complete leukemogenesis. For these mutations to occur, the precursor pre-malignant cells would have to undergo multiple cell divisions. The fact that the patients were immune-deficient provided a fertile environment for homeostatic expansion of these cells, allowing them the time and immunological space required to acquire the extra mutations to allow emergence of a leukemic clone, just as demonstrated in the study by Li et al. . Importantly, it was only the findings depicted in (b) that allowed the retrospective analysis shown in (a) to take place. At the time of initiation of the SCID trial, there was no way to predict that the use of the IL-2R3γ therapeutic transgene would lead to the predisposing oncogenic cooperation with the LMO2 gene . So why are these combined results of such encouragement despite being against the backdrop of some potentially tragic findings? First, they give us confidence that the use of retroviral, or integrating, vectors for transduction of most cell types is unlikely to cause cancer at a rate anywhere near the 20% (or, it is still possible, higher) seen in the SCID trial. Only under specific circumstances of co-operation between the vector-encoded gene, the insertion site and the ability of the transduced cells to expand in the patient, is there likely to be a significant risk of oncogenesis. Second, the findings indicate helpful ways in which vectors can be improved for future clinical development: the inclusion of suicide genes into the vectors would help in deleting any leukemic cells that might develop; the exposure of fewer stem cells to the vector, or inserting fewer copies per cell, will reduce the chances of leukemogenic clones developing; and other changes in vector design could be made to reduce the effects of transactivation of cellular proto-oncogenes. Third, they demonstrate that animal models can be developed that would more accurately predict the risks associated with protocols involving gene transfer into stem cells. Fourth, and perhaps most importantly, the data demonstrate that the adverse clinical events seen in the two patients with SCID are fully understandable in terms of the specific protocol used. This makes the events no more sinister to the eventual successful development of gene transfer as a therapeutic modality than the many thousands of adverse events, including fatalities, that have characterized the development of other successful drugs. Could the leukemias that developed in the children in the SCID trial have been predicted in the light of this knowledge? Possibly, but only if the clinical trials had been delayed until the implications of the model reported by Li et al. were available, and if the database search performed by the Copeland group  had been carried out prospectively instead of retrospectively. But Rome was not built in a day. It would be ludicrous to suggest that the clinical trial should have been delayed in the hope that (unknown) critical pieces of data would emerge at a later date: to do so would mean that no new therapy would ever go into patient trials. And, over and above all other arguments, there is one that sometimes seems to be missed. If the clinical trials of the SCID infants had been delayed, what would have become of those children - including the two who developed leukemias that have been well controlled (at least so far) - who currently live a quality of life way beyond that which they would have been granted in the absence of the gene transfer therapy? What cause withholds you then, to support him now? And men have lost their reason. Bear with me"